I like games that travel well. If you are a mom, you understand my statement. Games that have only a few parts or can be played easily in a variety of environments are perfect for families. My kids are swimmers. I like having games that can be thrown into a swim backpack, can be played by lots of kids in various ages and can get wet. UNO® Dice Game is a family favorite. If you have ever played traditional UNO, you will understand the premise of the premise of the UNO Dice Game. Players are to match color or numbers in a round. The goal is to get rid of all of their dice to win the game. But be cautious. If you can't play their turn, a player must take another die. Get ready for the fun and yelling UNO! There are two primary reasons that this game works well for my family. First, there is no reading involved. With kids at different reading levels, it can be difficult to allow them to play independently. The frustration over reading cards, instructions, etc can damper the fun before they begin. With the UNO Dice game, the kids just have to match numbers or colors. It is a simple game that I can watch from afar rather than being in the middle of the action. Second, for the swim parent, UNO Dice Game can get wet. At swim meets, there are tons of wet towels and kids. Playing cards do not fare well in the downpour. The UNO Dice Game can be dried off and set up again and again. The biggest concern is making sure all the pieces get back into the container. 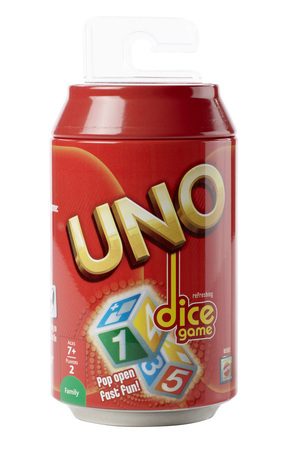 UNO Dice game can be purchased at various mass merchants as well as online. It retails for around $7.99. If you are looking for a fun stocking stuffer for the kids, I would definitely put UNO Dice Game on your list. I love games that travel well too. We are huge UNO fans. I've never heard of this new game. Oh, we have played that game and it ROCKS!My kids love it. My family loves playing UNO, so I'll have to pick this up for sure!